"Thought-Crime does not entail Death, Thought-Crime is death. This is the essential crime that contains all others in itself. April 4, 1984 from the past or to the future; to an age when thought is free from the Age of Big Brother from the Age of the Thought-Police - from a dead-man-Greetings." "An insidious brainwashing program set to be launched next week will "organically" weave the government's political propaganda into prime time network television shows, with positive talking points about Obama's environmental, bailout, health care and "servitude" agenda being seamlessly integrated into the content of dramas, reality shows and comedies. Under the auspices of a program run by the Entertainment Industry Foundation (EIF), network TV shows will be used to promote "service and volunteerism" on behalf of the public as part of a "week-long of television programming on all four leading broadcast networks ­ ABC, CBS, FOX, NBC, and all affiliated broadcast and cable properties as well, and other networks, beginning October 19." According to the EIF press release, "Network shows that will feature volunteerism in some way during the week of Oct 19th," include the following. Despite the fact that this was announced back in September, a new investigation by John Nolte has revealed all kinds of surreptitious connections that give a solid indication of what we can expect to be promoted by the TV shows that will effectively be under government control from Monday onwards. Any attempt to minimize the effects of this most recent edict from the US government's propaganda arm would be a monstrous mistake. 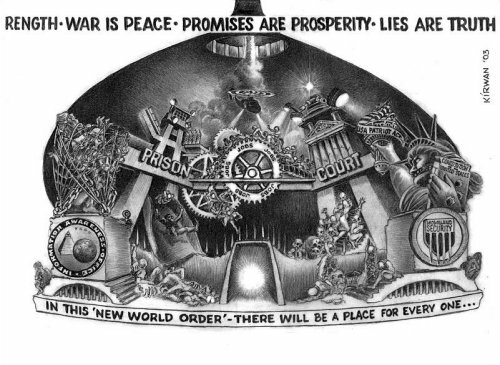 Given that we already have in place, the military components of the World of 1984 in our pledge of "unending war for unending peace" we must now add Newspeak and Thought Crimes to the list of crimes that this government will now be able to charge the people of this country with, as we continue to obliterate the founding principles of the United States. This latest government intrusion into the public arena of communications fits nicely with the already established illegal spying that was set up by Cheney-Bush; seven months before the massive criminal act of 911, that set-up the nation and the world for the precepts contained in "1984." 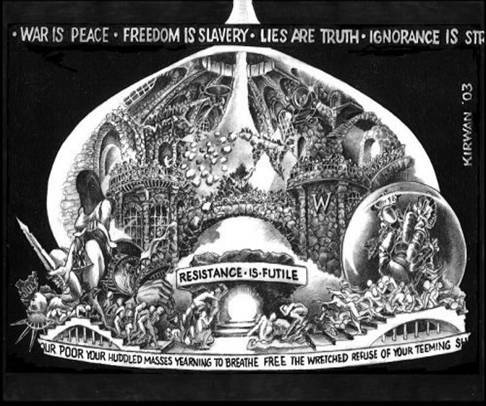 This latest obscenity that allows the government to use commercial-television to broadcast their political propaganda, as 'entertainment, while it continues to intensify and censor private communications of all types marks the actual physical beginning of the future, as foretold in George Orwell's film "1984." With this latest imposition, life in what was the USA will finally begin to look like the scenes in the film which are available in the first footnote below. These new invasions and misinterpretations of the problems which the world faces now are due in large part to the stealth-role that the extreme-left has always played in support of the far more public extreme-right; as that was played out by the Cheney-Bush Era on the global stage. "1984" is and was the result of both sides in this theoretical war for what's left of the minds & hearts of the walking manikins that this society has now become-almost without exception. The truth of that sentence will either be shown or denied, based on whether the government gets away with this new and far more blatant attempt to control our every thought and word, as well as deed. . .
3) Amnesty International Head Irene Khan on "The Unheard Truth: Poverty and Human Rights"